The entire store is on sale at Apples n Oranges! Up to 80% off! 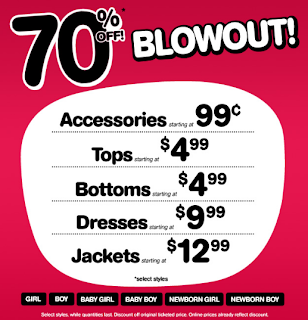 Some fantastic deals here, like Jack & Lily soft-soled shoes for just $6.75, some tops as low as $5. Styles available in infant and toddler sizes. Check it out at www.apples-n-oranges.com. Get 20% off diaper bags at Jamtots this week, it's their weekly deal! Brands include Diaper Dude (for the Daddies), Ju-Ju-Be, Amy Michelle, and BOB Stroller bags. The deal excludes Skip Hop Diaper bags. No code required, the discount will be applied in the cart. Deal ends January 6, 2011. Shop at www.Jamtots.com. They have a storefront in Victoria, BC. 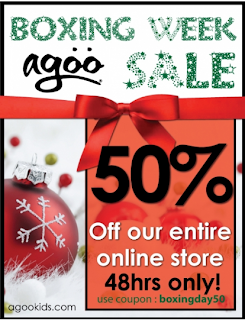 It's one of Agoo's biggest sales of the year! During their Boxing Week sale, enjoy 50% off their entire online store, just use code "boxingday50". Agoo offers superb quality active wear for babies and toddlers - UPF +50, stain resistant, and wick away moisture are just a few of their garments' performance features. They also have a neat product called 'Tushie Huggers' Agoo took their leggings and attached a chic skirt for baby girls and striking shorts for baby boys, to make a perfect 2-in-1 ensemble. 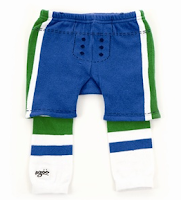 Now they also have 'Hockey Huggers' - designed to look like the hockey uniforms! Of course you can still purchase the legging styles as well, for boys and for girls. In super soft bamboo, these are great for keeping baby's legs warm and fabulous for EC/toilet training. Shop this deal at www.Agoo4u.com. This deal is on through December 31. 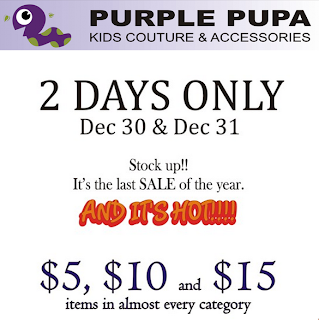 Today and tomorrow only, Purple Pupa is having a blowout $5, $10, $15 Sale! Purple Pupa Kids Couture and Accessories carefully handpicks the cutest, most unique, outfits on the market today. High end brand names such as Deux par Deux, Juicy Couture, Baby Lulu, Pepper Toes, Zutano, Little Soles Shoes, and more! Shop this deal at www.purplepupa.com. 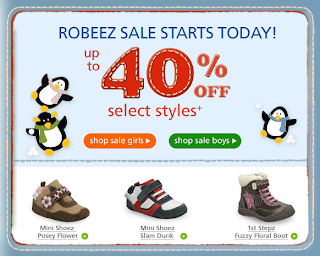 Robeez looks like they are clearing out their 2010 styles! They are having a big sale, up to 40% off. Lots of styles to choose from, starting at $14.99 Canadian! Plus you can get FREE shipping when you buy 2 pairs or more! To view boy styles, click here. To view girl styles, click here. No codes required for this deal! Shop at www.Robeez.com. In case you've wondered, all orders do ship from the US. The site indicates that there are no customs or duty charges applied to orders shipped to Canada. I've ordered from them before, just a couple of pairs per order, and have never had any extra charges applied. 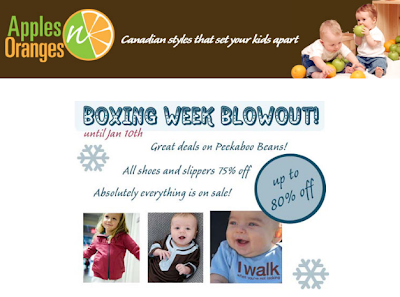 Storks and Berries' Boxing Week special! Get 10% off all regular priced items with the code 'BOXING WEEK' at checkout! The deal is on through December 31st. Storks & Berries is a mom-owned, home-based business offering the best brands of cloth diapers (such as AppleCheeks, Fuzzibunz, BumGenius) and baby carriers. They have expanded their product offering to include many enviro-friendly, safe, and Canadian products for babies and young children, such as nursing pillows, swaddling blankets, nursing items, skin care products, strollers and accessories, toys, and much more. Shipping starts at $3 if your purchase is less than $40 and can fit into an envelope for shipping in Canada. Otherwise $9.99 flat rate shipping in Canada and USA. FREE for most orders over $100. Check it all out at www.storksandberries.ca. 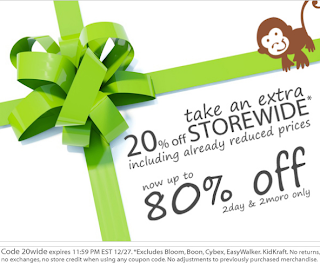 Wow, get an EXTRA 20% storewide at GingerBreadMonkeys! That's also on top of existing sale prices, for up to 80% off! Use code 20wide before Dec. 27, 11:59 PM EST. Excludes Boon, Bloom, Cybex, EasyWalker, Kidcraft.